Not exactly transportation. Something more primal. Something more seductive that has been introduced into the technological mix. Something irrational and powerful that will have to be taken into account as Earth’s six billion inventory their needs and, yes, desires. The problem is that we are asking the public and the industry both to be sensible about something that transcends the usual relationship between man and machine. Something altogether more primitive, more powerful, more precious and more personal. Love stories are all different, and all the same. I was barely thirteen when I saw my first 1955 Chevy pull into the parking lot at Southern Junior High School. It must have been the Fall of 1954, if I remember rightly how cars were released back then. I don’t know who owned it—probably a teacher married to a dealer, as we had some high rolling dealers in Owensboro, Kentucky, in those days. It was salmon and charcoal, a Bel Air two-door hardtop, probably with a 283, though it could have been a 265; almost certainly not a “blue-flame” six. Whitewall tires, dual exhausts, and a half-moon chrome-rimmed speedometer arcing all the way over to a cool 110. I didn’t have a driver’s license yet, but who cared? I was on my way to High School, and I knew that in a year or two I would be behind the wheel of–belonged behind the wheel of—if not that Chevy, one very like it. If I were a little older my first love might have been a T; a little younger, a GTO; a little more sophisticated, a Jag. But for me and my mid-Continent, mid-Century generation it was definitely the magnificent American automobiles of the mid-fifties. There had been a few false starts—the glamorous Fords and Mercs of 52–54, the 49–54 Olds and Caddys with the OHV V8s–cars that will always be remembered as harbingers. Then it happened, a sort of automotive Cambrian Explosion, and the fully modern auto was born. I personally identify it with the small block Chevies, but it could just as easily have been the breathtaking ‘55 Chryslers or the sleek ‘55 Fords, Mercs and Lincolns. Even Studebaker was a player—remember the Hawk? What ‘55 promised, ‘56 delivered and ‘57 topped. We watched them arive every year faster, sleeker, more beautiful, more stuffed with horsepower, promise and dreams. Later, when there were such things as critics, the critics called them “insolent chariots” and laughed at their fins, but we kids knew better. Still do. If there has arrived on this planet a better looking bouquet of machinery than the American automobile, ‘55 to ‘60, I haven’t yet seen it. If you doubt my taste log onto eBay and check the prices on the classics. Of course, we couldn’t afford them. We were kids. Our own cars, if we had them, were leftovers from an earlier age. The ‘50 Buick that wallowed like a whale on the rough country roads. The International pickup we jammed into for a ride to the Dairy Drive In (DDI) after ball games. The ‘49 Studie Champion with so little compression that the driver could jump start it alone. The ‘48 Jeepster I rebuilt in my uncle Sam’s garage, learning the mysteries of ridge reamers, ring compressors and Willys’ positive ground. These ancient cars were the humble soil from which the flowers of the ‘55s sprung, as bright and colorful as bluebells in a Texas median strip. 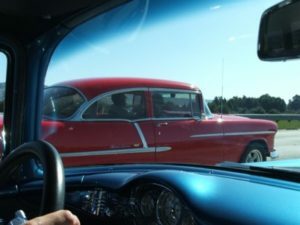 For ten years or so (five on the clock of my life) America’s cars were as new, as wild, and as world-altering as the rock’n’roll that came over their AM radios. Remember the lonesome sound of a dial between stations? I miss it still. If Destiny had a lottery in those days it was won by my car-crazy girl cousin, “Toot,” who drove to school in a cherry red ‘55 T-Bird. It was good-looking but geared too tall. Any V-8 Chevy, even a wagon with Powerglide, could beat it off the light, but what did Toot care? Boys love seeing a pretty girl in a T-bird in the rear-view mirror. Toot was a lucky girl, for her daddy winked at her racing and never took her T-Bird away. A disclosure: I never got my ‘55. Probably never will. I got plenty of rides in it, though. By ‘57 my best friend Charles had bought a ‘55 Bel Air, and who knows, it may even have been the same one that first stole my heart away. It was charcoal and salmon, a hardtop. Charles blew away everything in three counties, including a tri-power ‘57 Olds, a deuce rod with a jimmy, and my Uncle Sam’s ‘56 Mercury with a Lincoln 312 that had (supposedly) clocked over 130 at Daytona. I was barely sixteen the year I saw 100 for the first time. We were trying out the car on the four-mile long Panther Creek levee we called “the straight.” Like all who survived those car-crazy years before seatbelts, airbags or radial tires, I know I’m lucky to be alive. Charles himself succumbed to alcohol and a hairpin curve when he was barely twenty-one. I was too young and stupid then to be afraid. I sat watching the white line clip under that shapely hood, sipping a beer with my sixteen year old heart pumping wildly, when I looked over at Charles who was driving—and saw big tears running down his face. “What’s the matter?” I asked as I watched the speedometer inch up past 104, 105, toward 110. I feel the same way now, as we race into the new millenium, six billion of us behind the wheel or wanting to be. Still scared. And still hopelessly in love.